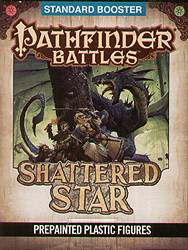 The Shattered Star Adventure Path puts heroes on the hunt for a sundered artifact of the ancient runelords, exploring the most dangerous dungeons of the Pathfinder world! These stunning pre-painted plastic figures bring the thrills of the Shattered Star to your game tables. Random assortment of 1 large and 3 medium or small figure in each box.